04.02.07 Players from Westbrook, Cheverus, Marshwood and Yarmouth gathered at Cheverus High School in Portland to compete in match play on Saturday March 31, 2007 for the title of Southwestern Maine High School Champions. It turned out to be a tight contest with a clear claim to the title resting on the final game of the Championship section. Yarmouth with two match wins and Cheverus at one win and one loss were tied at two games each with Reed Wommack playing Ivan Ivanov on Board 3. 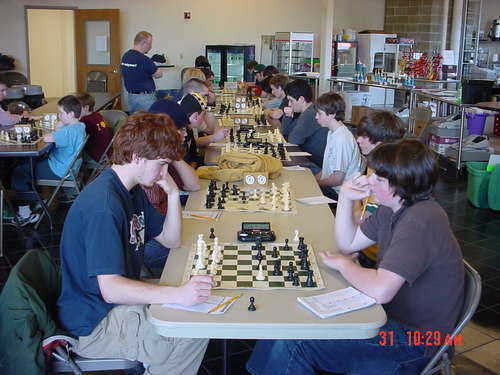 The second round just getting underway at the Soutwestern Maine Championships at Cheverus High School in Portland on March 31, 2007. The Championship section is in the foreground, the Reserve section towards the rear. Marshwood had already won their third round match with Westbrook and had to wait for the outcome of the Reed Wommack (Yarmouth) - Ivan Ivanov (Cheverus) game. The game seesawed back and forth until finally Reed was able to promote one pawn which forced Ivan to give up his rook. Reed queened another pawn and then gave checkmate to seal the win with only a couple of minutes left on the clock. The Yarmouth team, short one player which cost them a game each match, was thus able to complete a 3-0 sweep and avoid a three-way tie for the Championship between Yarmouth, Marshwood and Cheverus. Marshwood (Scott Massidda, Zach Avery, Sean McDermott, Joe Grace and Josh Avery) took home the second place trophy. The Yarmouth team consisted of Lucas McCain, Sanders Wommack, Reed Wommack and Jonathan Berryman. Boards finishing with perfect 3-0 records included Sanders and Reed Wommack for Yarmouth, and Matt Bowser for Cheverus. 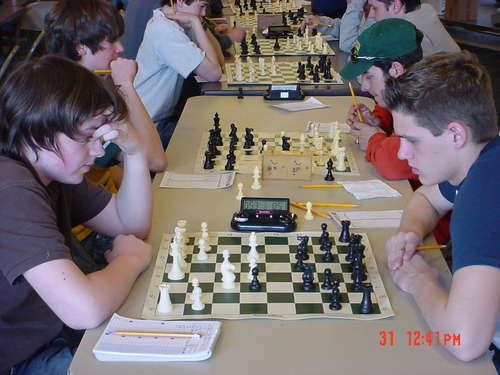 The critical final game of the Championship: Reed Wommack (near side) of Yarmouth faces Ivan Ivanov of Cheverus on Board 3. A win by Cheverus here would have resulted in a three-way tie between Yarmouth, Marshwood and Cheverus for the title. Reed won the seesaw battle and Yarmouth emerged the clear winner. The Yarmouth-Marshwood match (on left front to back): Scott Massidda, Zach Avery, Sean McDermott and Joe Grace for Marshwood face Lucas McCain, Sanders Wommack, Reed Wommack and John Berryman for Yarmouth. Yarmouth versus Marshwood in Round 2. Scott Massidda for Marshwood on left vs Lucas McCain for Yarmouth. This game would be drawn, but Yarmouth would win the match. Here, Lucas McCain (left) of Yarmouth squares off against Matt Arey of Cheverus on Board 1 in the last round. Westbrook vs Cheverus in the second round. On Board 1, Sam Touchette (right) for Westbrook takes on Matt Arey for Cheverus. 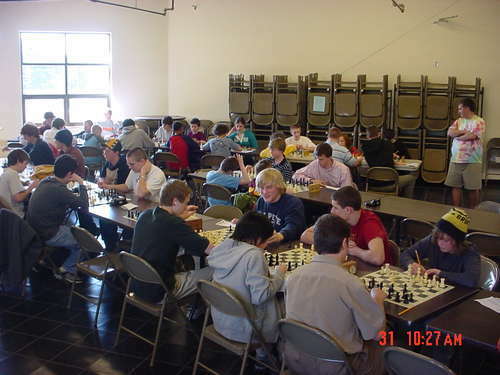 In the Reserve section, which consisted of High School and Junior High School Team and Individual players, and open to Elementary players for the first time, there were many exciting and hotly contested games. The Cheverus Reserve team (Ken Martin, Matt Kurz, Nick Couturier and Bridget Arey) took first place over Windham (Patrick Tolman, Cody Haskell and Avery Topel). The team from Cape Elizabeth (Peter Campbell, Brett Parker and Daniel Brett) took Junior High Team honors, with Peter Campbell turning in a stellar 4-0, performance against older opponents. His was the only perfect score in the section. In the Individuals Reserve High School section, John Soong of South Portland won a close final round game with Nick Couturier of Cheverus to win the first place trophy. Max Berube of South Portland took the second place trophy. Ben Morgan won the Individual Junior High School trophy with a score of three wins and one draw. 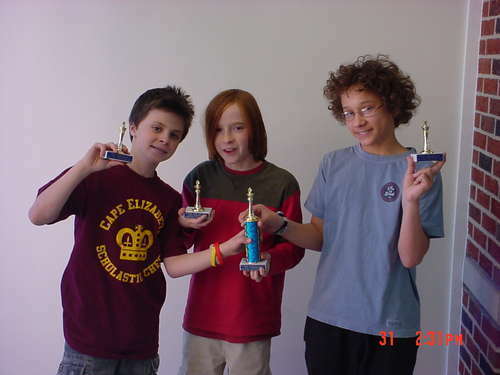 Jack Demeter (three points) and Nicholas Shedd (two and a half points), both of Cape Elizabeth, received trophies in the K-6 elementary section. Second round reserve action: Stanis Moody-Roberts (left) vs Nicholas Shedd in the foreground. 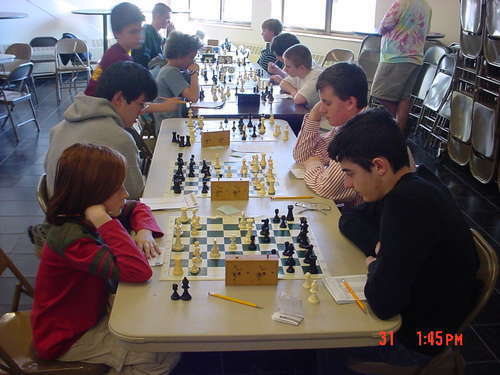 In order to avoid pairing players from the same school, elementary players were paired with JHS or HS players in the early rounds. 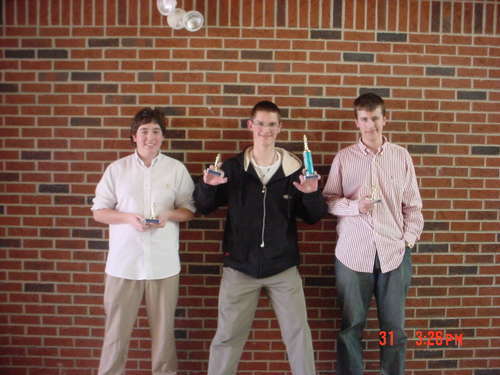 Far side of table (left to right): Ben Morgan (Individuals JHS winner), Peter Campbell (leading the Cape JHS team to victory with a 4-0 score), and Max Berube (2nd place HS Individual). Near side of table (left to right): Matthew Reale-Hatem (Cape Elizabeth), Cody Haskell (Windham) and Ken Martin (Cheverus). Ben and Peter would win their games while Max and Ken would draw. 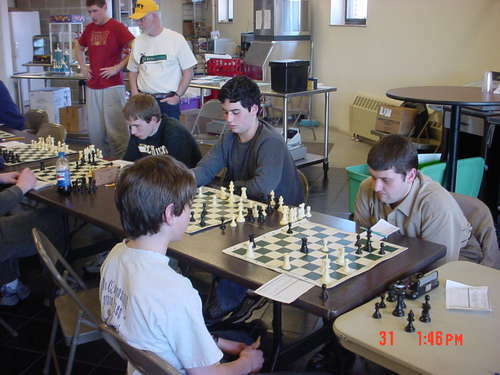 In final round Reserve action, Peter Campbell (left) plays Max Berube on Board 1, John Soong (left) vs Nick Couturier on Board 2 and on Board 4, Brett Parker (left) faces Ben Morgan. 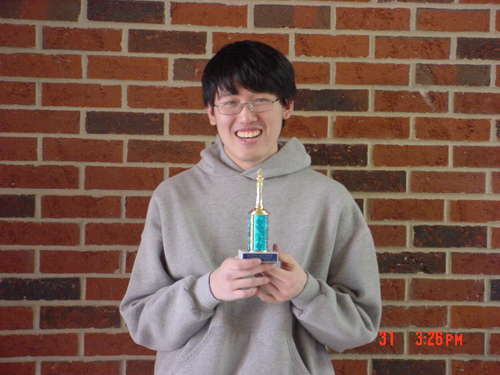 John Soong: High School Individual winner with 3 points. Second place High School Reserve Individual was Max Berube, but he slipped out before we could give awards. Junior High School Individuals winner Ben Morgan (3.5 points) with dad, Steve. The tournament was organized and directed by Ron Lewis with Cheverus Coach Dan LaVallee, and other volunteers assisting.